Mega thanks to Rail Europe, Northwest Airlines, the tourism folks from so many of our stops, along with the hotels, restaurants, bars, and attractions! Without you we be able to share the fun and information that we experience at each of our stops! Our Favorite ways to travel! You've got to try it! But you need to get your tickets before you leave the U.S.
RailEurope is the source for rail passes and rail tickets throughout Europe. We did our regular radio program LIVE from Studio B at the farm. Then with bags packed and gifts tucked away we were on our way to Grand Forks International Airport, then to Minneapolis, then to Amsterdam (Schiphol Airport) and then on to Berlin (Tegel Airport). We got to Grand Forks about 12:30 and everything was a go, my first class seats all reserved and excitement in the air. I love sitting in the "Shakespeare Seat" which is 2-B (Get it? 2 B or Not 2 B?). It always breaks the ice with the flight personnel in the front of the plane. I couldn't imagine doing what they do every day. Serving people in a cramped confined space, people who often treat them as 2nd class citizens is not my idea of an exciting career, so I try to find a way to put a little twist into their day, and maybe a smile or 2! So the trip to MSP was uneventful. Time was short between flights in MSP and so I hopped an electric car from one side of the airport to the other. Just got to gate F5 as they called the first class passengers to board so got on and got settled in my seat. There were lots of NON-REV's around me. These are passengers that are flying under a status called NON REVENUE or no pay. My seatmate was flying over to Europe to board a Northwest jet to bring soldiers home from the WAR in IRAQ. It was a great flight, she talked about how hard it was to take them over to IRAQ (via Germany) but she really enjoyed flying them home. She talked about how they have so much gear that it's ALL over the plane, and that there's just a narrow aisle for folks to walk through. The overseas flight took off at 3:35pm and then cause you're flying into the night, it's a tough flight for me. We're going to land in Europe at 6:40 the next morning, which is a new day with sunshine-or at least daylight and a lot of hours to be awake. BUT flying on the 3:35 flight makes it really hard to sleep cause in Minnesota time you're on the plane till 11:40pm (my regular bedtime). If you can take the 9:00PM flight, but the time the plane is up and you get a glass of wine and dinner it's midnight Minnesota time and so you can usually get in a 3 or 4 hour power nap which then get's you ready to meet the new day. PLUS you get to Europe about noon the next day and so the time is shorter till you can put your head on a pillow again...definitely always try for a late evening departure!! If you haven't flown across the oceans in First Class/Business Class, figure out some way to do it on your next crossing. It's a DIFFERENT WORLD! Not coming from a background of servants, and mostly being to cheap to stay in those four star hotels, I'm just not used to having people dote on my every wish and need. I got to tell you that after a while I just tell them that I'll let them know if I need anything but in the mean time, "I'M FINE!" I've been across the ocean now at least 10 times that I can remember, having the luxury of sitting in the front cabins. It's been on TWA, Western, KLM, and Northwest. Sometime you need to ask me about the TWA and Western flights. TWA was back in the glory days of flying (83) and we went Las Vegas-Phoenix-NYC. Then a plane change and a 747 from NYC to Paris, and return. I was on a "fam" (familiarization) trip with the Mayor Protem and some of the City Councilmen of Las Vegas. The highlight of the flight other than the nice wide seat, was that this was the first time in my life that I had had some good LAMB! A rack of lamb and it was awesome and has keep me looking for the equal ever since. But this time I didn't have the luxury and so I only got a few minutes power nap now and then, but no real REM sleep! We got in Early because of favorable winds and so 6AM Amsterdam time, WELCOME TO EUROPE. It's NOW WEDNESDAY MORNING. At least I didn't have a long layover in Amsterdam and was scheduled to be to Berlin by about 1pm. I cross Schiphol airport and get to the area where the Berlin flight was departing from. At 11:00 they start calling the flight and by 11:30 we're all onboard. Just one little problem. The main cabin door (it was a Boeing 737) refused to shut correctly. Seems one of the hand rails hadn't got into the proper "attitude" for closing and got pinched and so now even though it had had an attitude adjustment, it wasn't possible to get a good seal around the door! Here's comes a 40 minute delay as we all sit patiently. Then they offload us for another 40 minute delay. Then another, and finally they take off the luggage. I interpret that as a pretty strong sign that I'm not going to be flying to Berlin on that plane on that day! Then comes the announcement that we would be rebooked on other flights later in the day. So, ironically, I end up waiting for several more hours before my passage was complete. Instead of arriving in Berlin about 1pm I got in right during the rush hour. Fortunately Henry, my first foreign student, good friend, and host in Berlin, had gotten a message from KLM in Berlin as to what flight I would actually be on! He whisked me off to his 3rd story (no elevator) apartment right in the heart of the former East Berlin in a section called Mitte. I got unpacked a bit and we were off to supper. His NEW, FAVORITE, GOT TO GO TO, place. A Viet Nam style restaurant just around the corner. Although it was very good (cold spring rolls sort of) there just weren't enough Carbs to satisfy this Minnesota Farm Boy! Today's radio program will be coming from the Home of Henry Förster. We'll just have arrived in Germany and will be getting settled in our home-away-from-home. 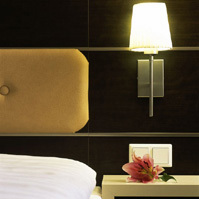 Some hotels just feel right, like those old shoes you keep wearing. The Hotel Fackelmann in Nuremburg is that way for me! Claudia (the owner) takes great care of everyone! We made history with the first V.O.I.P. broadcast back to America to both north and south stations on our network. They say technology is at its best when it's invisible to the user. Instead of using the telephone lines, we were sending signals across the Atlantic through the Internet. What a day it was. Certainly it demonstrates that this technology will be quick to arrive and be in daily use by not just a crazy radio host that travels the world but by everyday people who would describe themselves as being un-technological. Picked up by the Reitmeier family and a snowy drive to Sontheim and a pleasant evening of catching up with the last 2 years. After a typical Bavarian breakfast we headed to Austria and then to Switzerland- my very first time in Switzerland. Climbing and climbing at the side of the Alps we ended up in a wonderful chalet village, had a great lunch and watched Swiss family bobsledding down the side of the Alps sometimes for a mile without any interruption. Back to Sontheim for dinner and an evening of laughter and fun with the Reitmeier family. 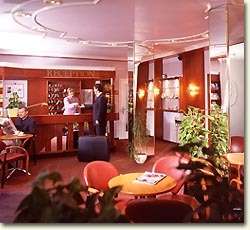 While in Frankfurt the cast and crew of John Reitmeier's Cool Site-Pick of the Day will be guests of the Bristol Hotel. Up early. Another great Bavarian breakfast and off the train station on Ulm. 2 hour train ride to Frankfurt, picked up by Fabian. Dinner on the Kaiser Strasse, the main street that leads away from the great train station in Frankfurt and a wonderful evening of catching up with Fabian. High speed ICE 350 KPH, actually to fast, you giggle a bit. In celebration of one of Henry's Grandmothers (Oma Kata) we are driving to Hamburg to attend a concert of Oma's favorite violinist. Hopefully we'll leave early enough so that we can do the radio show from somewhere on the road, then dinner in Hamburg, then the concert, and then back to Berlin to pack and get some sleep. We're back but not on Thursday, but on Saturday March 5. Amsterdam got a snow storm on Thursday that just shut down flying across Europe. After 4 hours in a queue to get rebooked I couldn't get a flight that would get me all the way home until Saturday. The extra couple of days were well spent with the Parents of a Foreign Student that lived with a friend of mine in Las Vegas. Thanks Peter and Ilona! We'll be filling in details and posting pictures here in the next days!! In Amsterdam we'll be joined by Philipp Reitmeier who's coming to America to visit us and see the USA on his time between high school and college. It's funny how 90 days can seem like such a long time, but between fishing, traveling, family gatherings, even a fishing weekend with the Governor of Minnesota, I know that the time will go much to quickly! 27 Köln? Henry flying down. SNOW in Amsterdam-flight changed to Sat. John Reitmeier/John Reitmeier's Cool Site Pick of the Day.